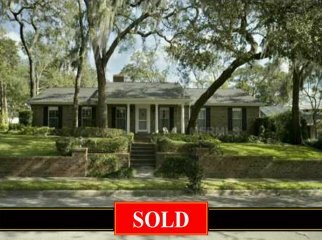 This charming all brick residence, framed by majestic Oaks, is located in one of Central Florida’s most sought after addresses – Winter Park. The home is nestled on a corner lot in beautiful “Sevilla”, a community of attractive executive homes and winding roads with lighted, landscaped islands. “Sevilla” is a wonderful neighborhood of friendly families and children. Throughout the year there are a few events for children and adults to commingle. The 5 bedroom is split 3-2 with beautiful hardwood and imported Italian porcelain flooring and moldings. The ceiling-to-floor windows in the front rooms allow you to enjoy a view of the exquisite landscape from the interior. Glass walls and doors span the entire rear of the house and overlook a 70’ brick Terrace which frames an oversized swimming pool under a domed screen enclosure. A large barbeque brick grill with vented chimney and web bar is just perfect for outdoor entertaining in this “southern” setting. A lovely 20’ wide brick ceiling-to-floor fireplace, with raised hearth and flanked by display bookcases, is the main focus in the poolside family room with its volume beamed ceiling and sliding doors opening to the brick terrace. The master bedroom has 2 walk-in closets. All bathrooms are large with long vanities. Women will love the oversized laundry room with exterior side door. The breakfast area features a lovely setting in the bay windows overlooking the verdant landscape. All of this is available in a very private setting with only one way into the community of only 60 home sites – and only 15 minutes to downtown Orlando. For years, many prominent business men and physicians have enjoyed the beautiful setting and have called “Sevilla” home. $850,000.